Remember when overnight oats became a trend and everyone started going crazy over this fast and healthy breakfast snack? Since that oaty frenzy, this simple recipe became a regular on my breakfast list. And it should be the same for everyone, too. Whether you’re a college student struggling with exams and deadlines, a hardworking employee or a busy parent with active kids, this simple breakfast packed with lots of vitamins and nutrients will be able to fuel you up for the whole morning. The best part about it is that you can make this the night before and it will be ready by the time you wake up. Now, if you’re a newbie in the game of oats, there are a few things you need to learn. Don’t worry, I’ve done the homework for you guys already. Steel-cut oats: Manufacturers use whole oat groats and roughly chop them with a sharp steel blade, hence the name. This kind of oats takes the longest time to cook compared to other kinds of oats below. Old-fashioned rolled oats: Whole oat groats are steamed and, instead of being cut with a metal blade, they are rolled and flattened into flakes, which allows them to cook faster than steel-cut oats owing to larger surface areas. Quick or instant rolled oats: They are quite similar to old-fashioned rolled oats, but they are rolled out even thinner so that they take less time to cook – perfect for a quick breakfast porridge. For this overnight oats recipe, it is best that we leave out steel-cut oats as they can’t absorb liquid like the other two. Now it comes down to just old-fashioned rolled oats vs. instant oats: which one should you use? I haven’t tried using instant oats for this recipe, but I think they would both produce relatively the same results. If you have tried making overnight oats with these 2 kinds of oats, comment below and share your experience. I’d love to know how they turned out! Is It Ok To Eat Raw Oats? During the production process, whole oat groats are slightly toasted at a low temperature, which deactivates the enzymes in the oats, reducing the risk of spoilage, so that they can last longer on shelf. Then before they are rolled into flakes, they get a good steam bath, making them soft and easier to be flattened out. So, raw oats aren’t technically ‘raw’ as we thought. Does that mean it is now safe to eat raw oats? Yes, as long as you soak your oats in some kind of liquid-like milk. Don’t eat raw oats because it can be hard for your stomach to digest and sometimes cause stomach irritation. Apart from that, there’s nothing more to worry about. In fact, there are lots of benefits that come from eating raw oats. You can see for yourself right here. How Long Do Overnight Oats Need To Sit? Ideally you would want to let them sit overnight or roughly 7-8 hours for a better result. After all, they are called ‘overnight oats’ for a reason. Make them the night before, pop them in the fridge and hit the sack. By the time you get up the next morning, they should absorb all that liquid and swell up nicely. Perfect for a healthy on-the-go breakfast. 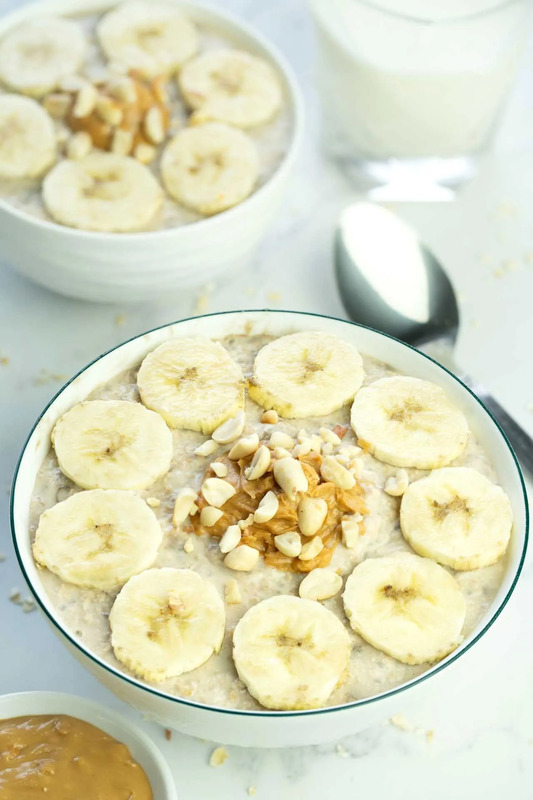 Okay, quick question: have you ever experienced that feeling when you get up one morning, don’t know what you should eat for lunch, and suddenly you’re craving some sweet oats? If that happens, you can just let your oats sit for 4-5 hours. Just make it in the morning,bring it to work with you and leave it in the fridge so you can enjoy it for lunch. Speaking of healthy breakfasts, I have a list of them right here! From a quick and light breakfast to a full hearty meal, from vegan to non-vegan, name it and you’ll have it! And the recipes are super easy to make; you can make them with your partner and/or your kids on a weekend morning. How much more fun can it get? Yes, you can. Again, it depends on your preference. You can eat your cold overnight oats straight out of the fridge. But personally, I like to put it in the microwave for a minute to take the chill off. You can leave it in a bit longer if you want a warm and hearty feel of porridge oats. Do keep in mind that every microwave oven is different from another, so just set it for 1 minute at a time to see how things turn out. No time for cooking? No time for breakfast? No worries. Overnight oats is here to the rescue and it is no hassle at all. You can now save time and stay in bed a little longer in the morning. No more hangry mornings! In a jar or an airtight container, combine all of the ingredients and stir them around so that everything is mixed in. Put the lid on and refrigerate overnight or at least 4-5 hours. To serve, add more milk if you prefer. Add toasted chopped nuts, peanut butter, fruits, or anything your heart desires. You can make a big batch to eat them throughout the weekday. Just leave out the banana and they can last up to 5 days in the fridge. Don’t add toppings to your oats from the night before. If you add fruits and nuts along with the milk, they won’t be fresh and crunchy by morning. So add them only in the morning. Feel free to use any type of milk you like, or opt out the yogurt. There is no real recipe here, just have fun with it. One recipe and great topping variations to accomodate each individual taste. It looks delish! Thank you! I can’t wait to see your very own version of it! I love this guide to oats. Bookmarking it for future reference. And wow, that looks SO delicious! My hubby is the oatmeal eater in our house—and I know he’d love these overnight oats!!! The banana version is quite lovely looking, but the avocado one looks really interesting.